I was cruising through Facebook the other day, and the ebullient Malcolm Frazer (one of the Brülosophy crew) posted a picture of tea brewed with tap water and with distilled water. It was a tremendous example of the effects of alkalinity and the extraction of tannins (polyphenols) from plant matter. The distilled sample was bright red and very clear. The tap sample was dark and murky. All of us beer nerds piled in and commented. Beautifully illustrated, and yet that was tea not a barley mash. With Malcolm’s permission, I am stealing this example to prove a point. To demonstrate the effect of alkalinity (and plagiarize Malcolm) on tannin extraction, I made tea using two sources of water: My tap water with estimated 503 PPM Total Alkalinity (as CaCO3), and my brewery RO water. The results are very clear. The RO tea is extremely bright, clear, and has a medium golden/brown color, where the Tap tea is dark, murky mahogany and very cloudy. In tasting, the RO tea is milder but robust with a fully rounded tea flavor, and a low astringency. The Tap tea is harsh and extremely bitter and highly astringent. I stopped drinking homemade tea because of this problem, but now have a solution. RO water results in lighter and clearer tea compared to my Tap water. 65K White box used to show color. RO tea clarity is incredible, while the Tap tea is murky and a bit cloudy. Of course, beer is not tea. Both tea and beer are made from steeping plant materials rich in tannin (Beer and Wine Journal), but beer seldom has the sharp astringency we expect even in the finest teas and would most often be considered a flaw. Paraphrasing Martin Brungard, “alkalinity is the enemy of the mash.” In context, he is referring to brewing water content with high concentrations of bicarbonate and carbonate ions, or simply, high alkalinity. We reference alkalinity in brewing water, as opposed to measurable pH which cannot easily predict buffering capacity. 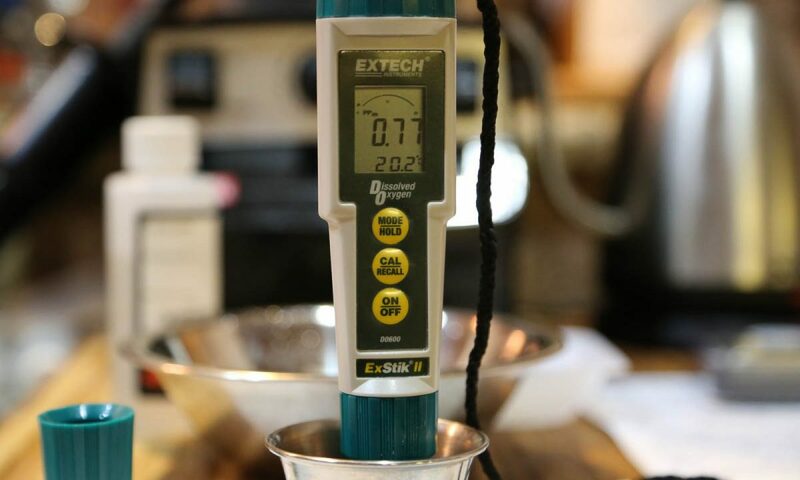 We can easily demonstrate1,2 that base malts generally reduce mash pH into the general range of 5.3-5.9 when mashed with distilled water at common mash thicknesses. Water to malt ratios (thickness) may dramatically impact the mash pH. Each individual malt will have a specific level of acidity. Dark specialty malts and some adjuncts added to the grist may increase acid in the mash. The level of alkalinity in our source water buffers or resists the acidity of the mash when we want our typical mash pH to fall somewhere between 5.2 – 5.6. For this reason, brewers regularly deploy liquid acid (lactic or phosphoric) to lower mash pH. Only occasionally will a brewer need to use a small addition, such as baking soda or pickling lime, to raise mash pH. All mash pH references below are measured at room temperature. Calcium or magnesium bearing mineral salts will also affect mash pH, where those ions react with malt phosphates to release free hydronium (H+), measurably lowering mash pH. It is useful to consider the ionic content of your brewing water in calculating mash pH estimates. For the purposes of this discussion, we are minimizing the effect of ions by using reverse osmosis water. Overly alkaline mashes (>5.8) can suffer from extraction of unwanted compounds from the husks of the grain, primarily tannins and polyphenols which may create astringency in your beer, especially with higher kilned and darker malts. Alkalinity in the mash can also rise during a continuous lauter, where sparge water alkalinity buffers the mash acidity. If the mash pH raises above 6.0 during sparge, then you also risk excessive tannin extraction. Astringency is defined by the BJCP as, “Mouth-puckering, lingering harshness, husk-like graininess.” To me, astringency comes across as sharply bitter with a tongue shriveling effect, especially on the soft palette tissues. Tannins, however, are required for beer to taste like beer and add structure and complexity, but in excess may create haze issues and a scathing mouth feel. To take this experiment a step further and evaluate the impact of alkalinity on a beer mash, I mashed 4 samples using a sous-vide water bath. The procedure used 4 ounces (113 g) of base malt (4.6L) with 400 ml of liquor (roughly 1.7 qt/pound water:grist). I used my standard coarse crush for my RIMS system. The four samples are tagged as: RO, RO+Acid, Tap, Tap+Acid. The acid additions were calculated in Bru’n Water Spreadsheet to achieve an estimated mash pH of 5.4. However, I made a huge error by adding roughly double the required acid to the Tap+Acid sample. Where the photos show labels that say (5.4)Tap+Acid, the actual pH was MUCH lower. The process is documented in the photos below. The samples were mashed at 158F/70C for 60 minutes, stirred completely every 15 minutes. The samples were then decanted and filtered through paper towels. They were not boiled, but we can compare color, clarity, wort yield, and extract. We expected the proper mash pH (acidified) samples to have the highest quality yield (volume and extract). I have attempted to color balance the comparative photos. While not perfect, the white balance helps to remove any reflective warm colors from my granite counter top and cutting board surface. Where possible, I used a white point prop to match between shots. This should help to discern more subtle color differences. 88% Lactic acid was measured to treat indicated samples to 5.4. However the Tap Sample was accidentally double dosed. Mason jars contained test mashes in water bath at 158F. RO mash adjusted to 5.4. Note the fraction of wort. RO test mash results. Note the fraction of wort. RO mash sample adjusted to 5.4 resulted in a clearer wort. Boiling the resultant worts may have yielded more dramatic results if the trub was allowed to settle. However sensory evaluation as well as measurements of gravity showed apparent benefits of the low alkalinity water and 5.4 mash. Generally the flavors fell along expectations. The acidified RO sample wort was sweet and mild, smelled of wet grain. The pure RO mash yielded a slightly less sweet wort, but just the slightest astringency – but I had to search for it (confirmation bias in action). In contrast the Tap only mash wort had a smokey aroma and a strong tea-like flavor and astringent bite. The over-acidified mash was tart, overwhelming any malt flavors. I have never sour mashed or kettle soured a beer. The lactic acid overdosed wort (Tap+Acid) was cloudy, milky and the grains were starting to break down significantly. I just don’t see this clearing up, even with a strong boil and Whirlfloc. I left this sample in the findings as a lesson on what happens with very low mash pH. It has the lowest yield in wort volume and extract. From a purely sensory perspective, it may be hard to distinguish the RO versus RO+Acid batches, but the numbers illustrate the benefits of proper mash pH in yield and extract. The differences in the amount of yield were surprising, illustrating the impact pH has on the grain itself. The proper pH (5.4) samples were softer than the high pH (7.26) samples, showing better hydration throughout the endosperm. The very low (4.2) pH samples looked like porridge as the malt lost its structure. As you can see in the chart above, extract yield tracked as expected. One final thing to discuss is the residual acid ion concentration from use in mash or kettle. I used Bru’n Water to estimate the residual lactic acid ion (lactate) for both acidified mashes. If you are using a lot of acid to overcome alkalinity, the differences between 157 ppm and 1010 ppm lactate is striking! My preferred level of alkalinity for brewing water is somewhere between 40-80 ppm as CaCO3 which will limit the amount of acid required. While arbitrary numbers, this is a reasonable level that can be easily managed with minimal acid. In my opinion, alkalinity as high as 130-150 ppm can also be managed, but you may wish to use phosphoric acid which has a higher flavor threshold than lactic. Levels over 150 ppm should be managed with dilution with RO or DI water. Short of doing this experiment again on a large enough scale to ferment batches, it is difficult to draw empirical conclusions on the finished beer. I expect the differences between the RO and the RO+Acid examples would be difficult to distinguish, however I can speak from experience that non-acidified batches using my tap water created significantly astringent results. Changing my liquor from filtered tap to RO had a dramatic impact and improvement. Of course, my tap water is completely inappropriate for brewing nearly all beer styles and is at the edge of the extremes of alkalinity. I build every batch from 100% RO using appropriate levels of mineral salts by style and preference. I continue to maintain that hitting the proper mash pH has the largest impact on delivering fully flavored malty extract. Well – This little rural section of Bastrop to the east of Austin might be stout country. Austin’s water is far more moderate and good for a wide range of beer styles.